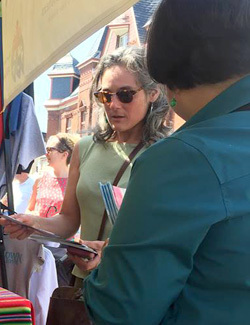 The Maryknoll Sisters of St. Dominic were out and about in May and June attending local street fairs in Tarrytown and Ossining, New York. More photos are available on their Facebook page. 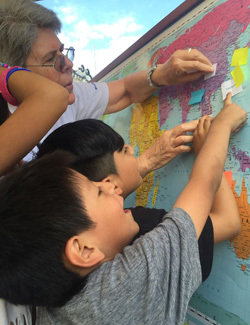 Above left: At the Ossining Fair, sister Regina Pellicore helps boys find countries where Maryknoll Sisters serve. Above right: Sister Marvie Misolas vists with a New York Times photo editor at the Tarrytown Fair. The woman said her first awareness of world issues came from reading Maryknoll Magazine!